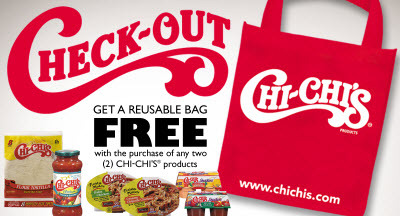 Get a reusable bag FREE when you purchase any two (2) CHI-CHI’S products! Original cash register receipt(s) dated between August 1, 2009 and April 30, 2010, with purchase prices circled. Two (2) original UPC symbols from any CHI-CHI’S Products (excluding liquor). RECEIVE: One CHI-CHI’S Reusable Bag. Order form must be received by 5/15/10. St. Cloud is where I live!